Proving that there's still life in old cliches like 'taking coals to Newcastle,' London outfit Minibar have successfully crafted a sublime slice of prime Americana right under their current hosts' noses. 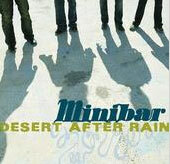 Since first seeing the band play in London just over 2 years ago and thinking at the time that I'd stumbled upon something special, Minibar have signed to Outpost, Whiskeytown's former label, just in time to see the Universal imprint closed down following boardroom manoeuvring and corporate merger. Refusing to accept defeat the band then saved enough money to get them to the U.S. for about 2 weeks. Some 2 years later they're still there. Now signed to another Universal imprint, Cherry Entertainment, having had the good fortune to be in the right place at the right time, the band's debut album, Road Movies, just out in the U.S. has been produced by long-time roots/country luminary, T-Bone Burnett. Like Peter Bruntnell's wonderful Normal For Bridgwater album, which has been picking up excellent reviews since its belated release in the U.S. late last year, Minibar have drawn on the rich pop heritage of their home country and spliced it, seamlessly onto the country rock influences of Gram Parsons or Gene Clark. The authentic feel of the album, often wistful, but ultimately offering both hope and optimism, was no doubt further inspired by the Californian vistas of Los Angeles where the album was recorded. The production by T-Bone Burnett succeeds in emphasising the bands strengths and it's hard to imagine singer Simon Petty's warm, breathy vocal tones, the tight accomplished playing of drummer Malcolm Cross and bass player Sid Jordan - whose equally adept two-part harmonies are such an asset - or the contributions of multi-instrumentalist Tim Walker, who handles all of the album's guitar, pedal steel, mandolin and banjo duties sounding any better than they do here. Just a little less studio polish would have satisfied my personal taste as the sound is occasionally a little too polite, but that's a minor quibble. The material, with the exception of the Ryan Adams penned "Choked Up," a track originally scheduled to be included on the long-delayed Whiskeytown album Pneumonia, is co-written by all four of the bands members and it's immediately apparent from the wonderful opener "Holiday From Myself" onwards that they have a common vision which has gelled into something of genuine quality that's built to last. Amongst a plethora of highlights is "Six Foot," which as well as allowing Tim Walker to demonstrate his guitar prowess with a great southern flavoured solo, contains the Byrds indebted lyric "I'm six foot tall on a good day. I'm eight miles high when I try" which perhaps also indicates the band's lofty ambitions. Walker later pays a musical debt to the country rock pioneers via his brief Byrds flavoured solo on "Visible From Space." Bizarrely, at the time of writing, Road Movies isn't even set for a UK release and whilst I'm sure the band, who seem to have adopted the U.S. as their new home, are probably focussed on achieving success there and under some pressure to do so, signed as they are to a U.S. imprint, I sincerely hope they've left something important at home necessitating an immediate return. At which point we can seize their passports and impose a compulsory purchase order. They're simply too good to let go.